A 2-week-old girl had been born to a 28-year-old gravida 2, para 1 mother at 39 weeks of gestation following normal spontaneous vaginal delivery. The mother had had diabetes mellitus during the pregnancy, which had been well controlled with diet. The neonatal course had been uneventful. In particular, there had been no hypoglycemia. The umbilical cord had fallen off when the infant was 10 days old. The mother was concerned that the umbilicus of the infant looked abnormal. The umbilical protrusion did not increase in size when the infant strained or cried. There was no discharge or bleeding from the umbilicus. The infant was asymptomatic and thriving. 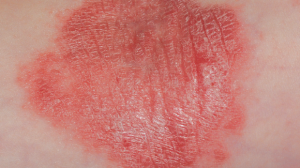 A PubMed search was conducted in December 2018 using the Clinical Queries tool with the key terms umbilicus cutis OR cutaneous umbilicus. The search strategy included randomized controlled trials, meta-analyses, observational studies, clinical trials, reviews, case reports, and letters to the editor. Unfortunately, no information could be retrieved from this search. 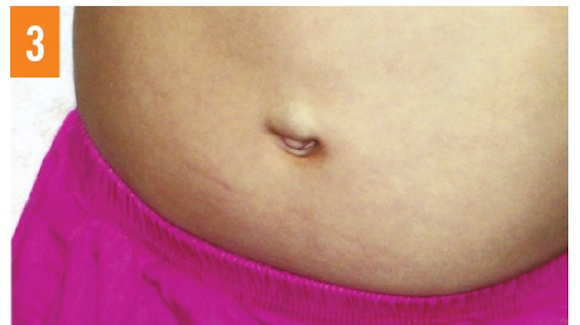 Clinically, umbilicus cutis presents as a projecting cylinder of skin in the periumbilical area that extends up the sides of the umbilical cord, forming an outpouching after the umbilical cord falls off.1 The condition is asymptomatic. 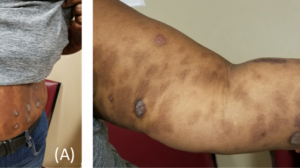 Although umbilicus cutis is usually an isolated anomaly, it has been reported to be associated with Axenfeld-Rieger syndrome and Robinow syndrome. The diagnosis is clinical based on the characteristic physical finding. No investigation is necessary. The differential diagnosis includes umbilical hernia, paraumbilical hernia, umbilical granuloma, umbilical polyp, patent omphalomesenteric duct, and omphalocele. 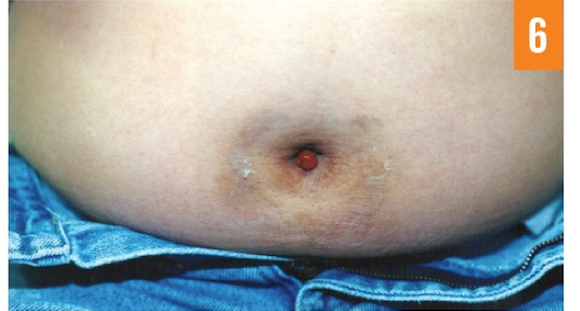 Umbilicus cutis must be differentiated from an umbilical hernia. In umbilicus cutis, there is a lack of fascial defect, and there is no further protrusion when the infant cries or strains. Classically, an umbilical hernia presents as a soft, skin-covered swelling that protrudes through the fibrous ring at the umbilicus (Figure 2).7 The umbilical bulge becomes more apparent during episodes of crying, straining, or coughing, and is easily reducible.7,8 The content usually consists of a piece of small intestine and sometimes omentum, fat, or peritoneal fluid. 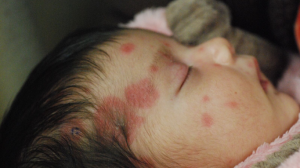 The condition is usually recognized in the neonatal period and is usually asymptomatic. 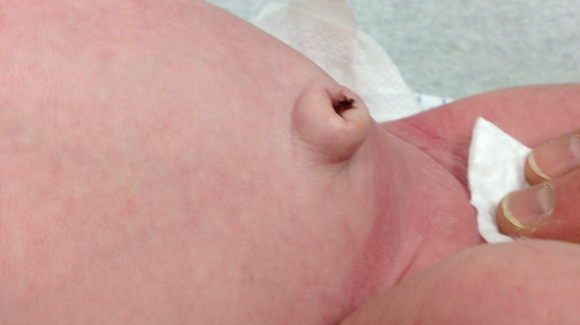 Most umbilical hernias resolve spontaneously, usually within the first year of life. In contrast to an umbilical hernia, a paraumbilical hernia does not protrude through the umbilical area. Rather, the hernia protrudes just above (referred to as supraumbilical hernia) (Figure 3) or below (referred to as infraumbilical hernia) the umbilicus. 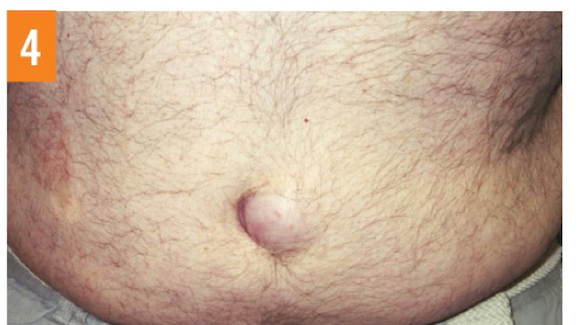 At times, it may be lateral to the umbilicus (Figure 4). A paraumbilical hernia is at risk for strangulation and incarceration. Also, a paraumbilical hernia usually does not resolve on its own, often requiring elective herniorrhaphy. 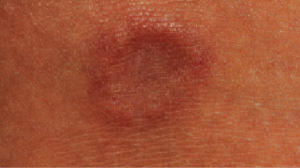 An umbilical granuloma forms from excess granulation tissue persisting at the base of the umbilical area after separation of the umbilical cord.9 The condition represents continuing inflammation of the granulation tissue that has not yet completely epithelialized. 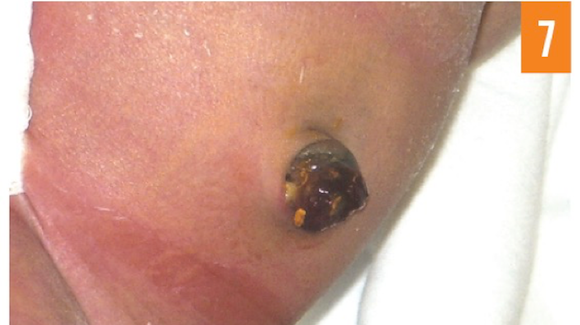 Delayed separation of the umbilical cord increases the risk of granuloma formation.7 The presence of saprophytic organisms in the umbilical area increases the chance of invasion by pathogenic organisms. 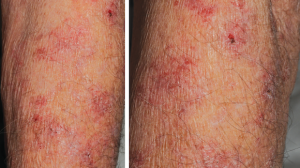 Typically, an umbilical granuloma presents as a red papule or a pedunculated mass that has a soft, moist, velvety, and friable appearance (Figure 5).7,9,10 The size ranges from 3 to 10 mm in diameter.7,10,11 Persistent serosanguinous or serous discharge from the mass is characteristic.10,12 The mass may bleed with minimal contact.10 An umbilical granuloma usually responds to cauterization with silver nitrate. 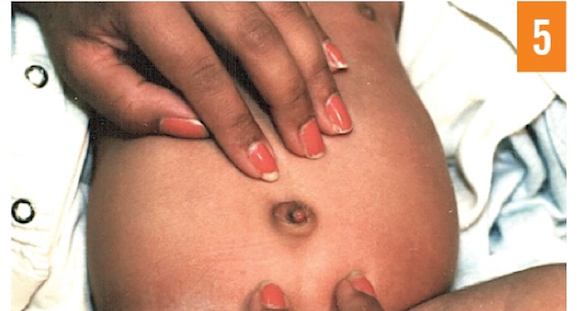 An omphalocele is a congenital anomaly of the anterior abdominal wall in which the abdominal viscera herniates through a central defect at the site of the umbilical ring (Figure 8).19,20 An omphalocele presents as an umbilical mass covered by a translucent membrane that is composed of peritoneum on the inner surface, amnion on the outer surface, and Wharton jelly between the layers.19 The umbilical vessels insert into the membranous sac, and the rectus abdominis muscles insert laterally on the costal margins. The defect is usually in the mid abdomen and rarely occurs in the upper or lower abdomen. 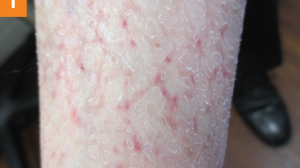 Umbilical cutis is a benign anomaly. The condition, however, can be cosmetically unsightly and socially embarrassing for those wearing swimming suits. While no treatment is necessary, plastic surgery for cosmetic purposes may be considered. 1. Leung AKC, Fong JHS. Case 4: Sara’s stomach. Can J Diagn. 2008;25(9):59. 2. Leung AKC, McLeod DR. Autosomal dominant flat umbilicus. Am J Med Genet A. 2004;131(3):307-309. 3. Seifi M, Walter MA. Axenfeld-Rieger syndrome. Clin Genet. 2018;93(6):1123-1130. 4. Song W, Hu X. The rare Axenfeld-Rieger syndrome with systemic anomalies: a case report and brief review of literature. Medicine (Baltimore). 2017;96(33):e7791. 5. Mishra S, Agarwalla SK, Pradhan S. Robinow syndrome: a rare diagnosis. J Clin Diagn Res. 2015;9(12):SD04-SD05. 6. Murali CN, Keena B, Zackai EH. 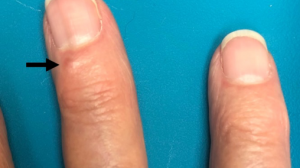 Robinow syndrome: a diagnosis at the fingertips. Clin Dysmorphol. 2018;27(4):135-137. 7. Leung AKC. Umbilical hernia. In: Leung AKC, ed. Common Problems in Ambulatory Pediatrics: Specific Clinical Problems. Vol 1. New York, NY: Nova Science Publishers Inc; 2011:23-26. 8. Troullioud Lucas AG, Mendez MD. Hernia, pediatric umbilical. In: StatPearls. Treasure Island, FL; StatPearls Publishing LLC; 2018. https://www.ncbi.nlm.nih.gov/books/NBK459294/. Updated October 27, 2018. Accessed January 18, 2019. 9. Brady M, Conway AB, Zaenglein AL, Helm KF. Umbilical granuloma in a 2-month-old patient: histopathology of a common clinical entity. Am J Dermatopathol. 2016;38(2):133-134. 10. Sanyaolu LN, Javed M, Wilson-Jones N. A baby with a discharging umbilical lesion. BMJ. 2016;355:i5587. 11. Kadian YS, Verma A, Rattan KN, Kajal P. Vitellointestinal duct anomalies in infancy. J Neonatal Surg. 2016;5(3):30. 12. Muniraman H, Sardesai T, Sardesai S. Disorders of the umbilical cord. Pediatr Rev. 2018;39(7):332-341. 13. Agrawal S, Memon A. Patent vitellointestinal duct. 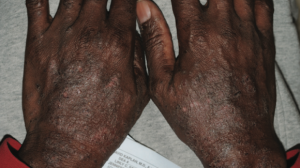 BMJ Case Rep. 2010;2010:bcr1220092594. 14. Pacilli M, Sebire NJ, Maritsi D, et al. Umbilical polyp in infants and children. Eur J Pediatr Surg. 2007;17(6):397-399. 15. Ramoutar A, El Sheikh S, Aslam A. A persistent umbilical nodule. Clin Exp Dermatol. 2017;42(7):814-816. 16. Swanson DL, Pakzad B. An umbilical polyp in an infant. Cutis. 2005;76(4):233-235. 17. 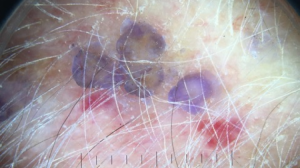 Norman RA, Dewberry CT. Dermatologic presentation of omphalomesenteric duct remnant. Skinmed. 2006;5(3):154-155. 18. Leung AKC, Wong AL. Patent omphalomesenteric duct. In: Lang F, ed. Encyclopedia of Molecular Mechanisms of Disease. Berlin, Germany: Springer-Verlag; 2009:1589-1590. 19. Leung AKC, Robson WLM, Wong AL. Omphalocele. In: Lang F, ed. Encyclopedia of Molecular Mechanisms of Disease. Berlin, Germany: Springer-Verlag; 2009:1521-1522. 20. Raymond SL, Downard CD, St. Peter SD, et al. Outcomes in omphalocele correlate with size of defect. J Pediatr Surg. 2018; S0022-3468(18)30670-5. 21. Ekot EA, Emordi VC, Osifo DO. Does omphalocele major undergo spontaneous closure? J Surg Case Rep. 2017;2017(8):rjx156.